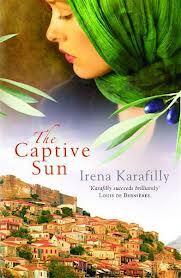 Today I am bringing you the second half of a discussion between Lauren from Australian Bookshelf about The Captive Sun by Irena Karafilly. Lauren's thoughts are in green and mine are in black. You can read the first half of the discussion here. Lauren: Calliope was against re-marrying when she became a young widow as she didn’t think she was fit to be a wife. That with her numerous, publicly known relationships was quite controversial in this traditional village (not that she cared what people thought!). What did you think of some of Calliope’s other relationships over the years? Marg: While the sense of connection to Lorenz was pretty strong, and I do think that they loved each other deeply, I was surprised by at least two of the other relationships that Calliope had. There was one other relationship that I thought was really right for her, but unfortunately fate in the form of a civil war stepped in and it wasn’t to be. As a reader I was very moved when that particular relationship ended, in a way that I wasn’t when it came to many of the others. Lauren: I think in some ways I was surprised and some ways not. I was surprised about the same two love interests partly because I was pretty hung up on the fact I wanted Calliope and Lorenz to reconnect (and I never really got over that!) and also because the development of her relationships outside of Lorenz was never really shown. A chapter or scene usually just picked up from a point in her life and it was like.. oh by the way she’s in a relationship with this guy. Whereas with Lorenz there was a lot of time and space provided in the story to watch their friendship grow into a romance. On the other hand, I wasn’t surprised by her choice in lovers. Each lover was a man whom she had a deep connection with that was built on a strong friendship and those relationships were quite lengthy. Marg: Do you think that Calliope’s freedom and lifestyle choices would have been fundamentally different if she had of had children and how did you feel when she changed her mind on the question of marriage? Lauren: Yes, I don’t think she would have had the autonomy to pursue the causes she was passionate about. Particularly because of the traditional role of the mother and wife within her community. I was happy that she changed her mind about marriage, because I felt she was really quite hard on herself for a long time. She always thought of herself as a selfish person- because her mother believed that- and yet I never felt she was. In fact she did many things that were quite selfless. She was very loyal to those she cared about. Another belief about herself that was challenged was that she didn’t think she was made for marriage. She feared she couldn’t be faithful in a marriage and yet (from what I recall) she was never disloyal within her romantic relationships. Marg: You touched on something a few paragraphs ago that I wanted to explore a little in our conversation, and that is the structure of the book. The book covers a long period of time and as such there were times when I did feel like we were skipping from one episode to the other. The fact that the book does cover the war as well as the civil war and then on into the political upheavals of the 1970s does give the book a point of difference, but there were times when it did feel as though it was missing a bit of depth, or a maybe focus is a better word. I am not sure if I wanted it to just focus on WWII but I wanted more of the really interesting parts. It may just have been that the story was too big to be contained! Don’t get me wrong. I still enjoyed the book and ended up giving it a rating of ⅘ but I was left thinking there was more story that could have been told. Calliope Adham – young, strong-willed, and recently widowed – is schoolmistress in the village of Molyvos when Hitler's army invades Greece in 1941. Well read and linguistically gifted, she is promptly recruited by the Germans, who force her to act as their liaison officer. It is the beginning of a personal and national saga that will last well over thirty years. Calliope's wartime duties bring her into close contact with Lieutenant Lorenz Umbreit, the Wehrmacht officer in command of her village. Their improbable friendship blossoms despite Calliope's clandestine work for the Resistance, in a fishing village seething with dread and suspicion. Amid privation and death, the villagers' hostility finally erupts, but the bond between Calliope Adham and Lorenz Umbreit survives the Occupation, taking unforeseeable turns. Their complex, defiant relationship continues through several tumultuous decades, as Greece is ravaged by civil war, oppressed by military dictatorship, and finally liberated in the mid 1970s. It's interesting to me that you both felt that the story was a little too big to be contained, and that it was not developed in the ways that you expected it to be. I think I might have preferred for the book to focus on the social aspects rather than the emotional ones too, but it sounds like this book is worth reading. Very nice joint review/discussion. It would be interesting to see what I think of it.